Start those engines and prepare to tend to your fields as the next entry in the popular simulator series has arrived with the launch of Farming Simulator 19. This year the series is going even bigger with overhauled graphics, a larger roster of vehicles, and even the ability to ride your own horses! The game has new vehicles, activities, crops, animals, and tools to get the job done, no matter the task. Expect plenty of licensed vehicles to choose from as Farming Simulator 19 offers over 300 vehicles and tools from major brands including John Deere, Case IH, New Holland, Challenger, Fendt, Massey Ferguson, Valtra, Krone, Deutz-Fahr and more! Help a friend build up their farm with the return of Multiplayer, or try out the brand new competitive mode to see who the best farmer is. Like Farming Simulator 17 before it, Giants are also giving players plenty of customisation opportunities thanks to mod support. 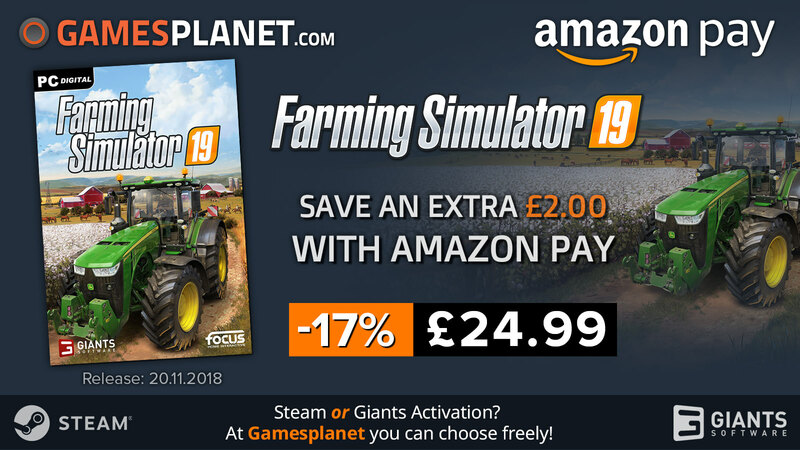 Farming Simulator 19 is out now. You can purchase the game to save 10% off, and if you use Amazon Pay at the checkout you'll get an extra £2 off your purchase! Note: Offer Valid until November 25th.